Welcome to the first blog post of my Social and Green Olympics series! According to Inhabit, this year’s Olympics is the most sustainable so far. Even though environmentalists aren’t so happy about the decision, Dow Chemical and BP are the largest corporate sponsors in this year’s Olympics. Regardless of the negative environmental allegations against these companies, I was interested in the green buildings being built for the games! This list includes the top 6 green buildings in London, all of which include sustainable building techniques and other environmentally friendly building practices. 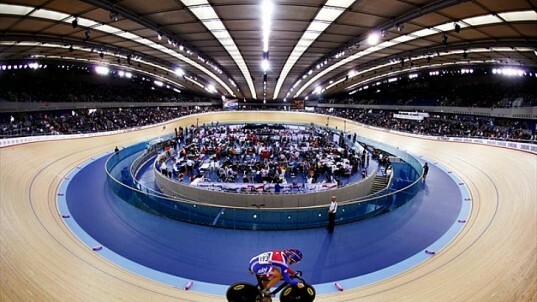 London Velodrome: cycling center which will remain after the games. This structure features natural ventilation instead of air conditioning and rooftop skylights which lessens the reliance on artificial lights.The Olympic committee originally planned on having a rainwater harvesting system, but the water system was deemed less efficient use of financial resources, so it won’t be built. Basketball Arena: obviously, the basketball arena. Completed under budget and on time, which is quite a feat for a building as large as this one, is the Olympic’s largest removable venue. The “tarp” (made of phthalate-free PVC tarp) that is used as the roof can be packaged up and used elsewhere upon completion of the games. The structure will be re-used in the 2014 FIFA World Cup in Brazil, and rumors are circulating that the plastic will be used in the 2016 games in Rio de Janeiro as well. Aquatics Center: quite obviously, again, for aquatics. This structure’s roof was made from sustainably sourced timber, and it’s outside was constructed out of concrete, which reduced the need for paint and lowered the amount of construction emissions. The interior stands are made of PVC wrap and steel, both of which will be recycled at the conclusion of the games. Finally, most of the other materials used to build the remaining part of the structure, including the locker rooms, were sent by train instead of truck, which is a great way to eliminate emissions. 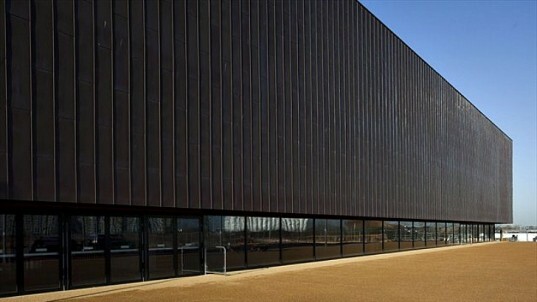 Copperbox: handball arena. Inhabit marks this arena as the most sustainable and most interesting. 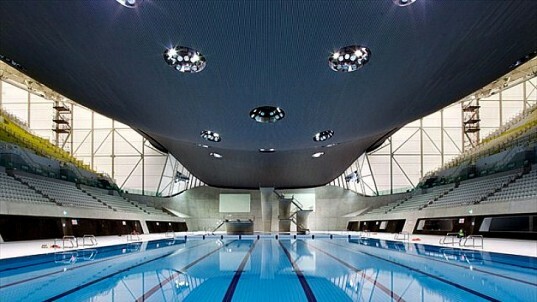 Lighting pipes on the roof decrease electricity in the arena, a rainwater harvesting system will reduce the amount of water taken from the citizens of London, and the exterior panels are crafted from recycled copper. 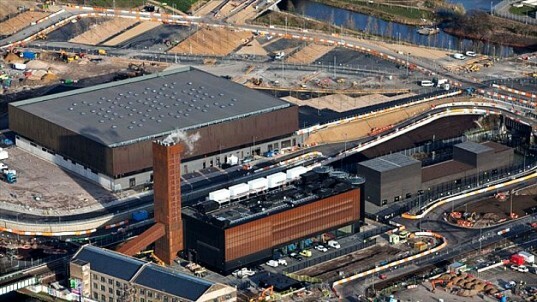 This arena was partially built out of bricks made from construction dust, and will be used by the citizens of London in the future for local sporting events. Shooting Ranges: indoor shooting ranges. 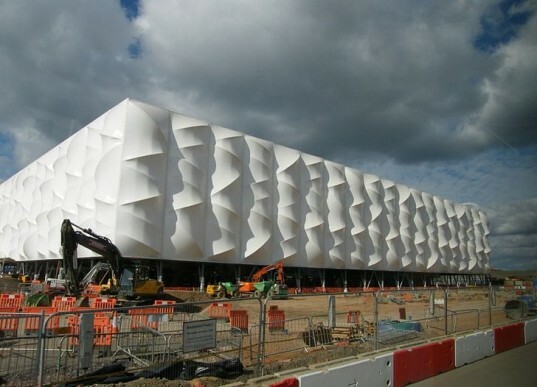 Three of these venues were erected out of steel, plywood, and phthalate-free (environment-harming plasticisers) PVC membranes, all of which will be reused or recycled after the Olympics. 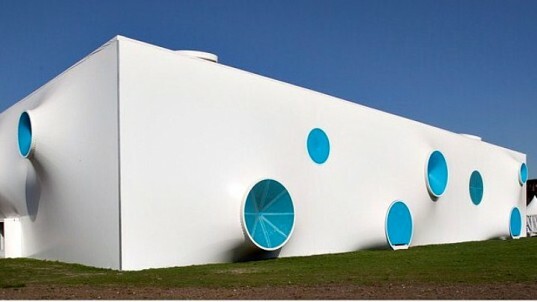 The “suckers” on the outside of the venues act as natural ventilation for the structures. The Energy Center: center which heats, cools, and powers the Olympic Zone. This is by far the least aesthetically pleasing venue, but it is responsible for powering the Olympic games through gas boilers, biomass boilers, and a wastewater treatment plant. The boilers use wood chips and gas to generate heat, and the wastewater treatment facility collects wastewater and redistributes it into the toilets in all of the arenas. All images can be found here, on Inhabit Design’s webpage. Stay tuned for more green Olympic news!